Blue, the color of the sky, the color our police officers wear to protect the community and, for April, the color for Autism Awareness Month. 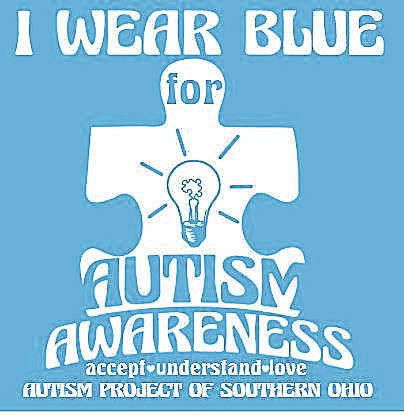 Hopefully, we will see lots of blue this month, thanks to a group of people that make up the Autism Awareness Project of Southern Ohio. 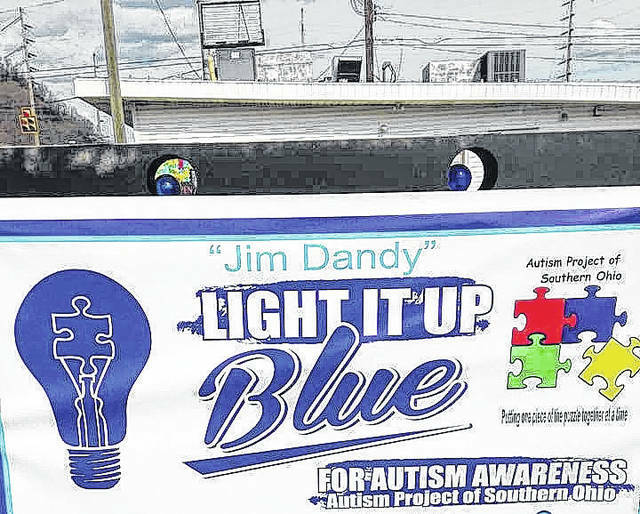 The group’s annual Light It Up Blue for Autism Awareness is 5 to 9 p.m. Monday at Jim Dandy’s in Portsmouth. The day is chosen because April 2 is World Autism Awareness Day. Mike Bell, president of the Autism Awareness Project of Southern Ohio, says this is truly worldwide, and if people get on Facebook Monday night, they can find pictures of places like the Taj Mahal and the Eiffel Tower lit up in blue. It is all to recognize autism awareness. Bell says 1 in 48 children are born with autism. Due to projects such as Autism Awareness of Southern Ohio, and other valuable groups who bring awareness to autism, they promote early awareness so these children can be found early on, which is key. When signs of early autism are noticed, children can be taken to their pediatrician, who can refer them to Columbus Children’s or Cincinnati Children’s for further evaluation. The event is a big celebration for autism awareness. 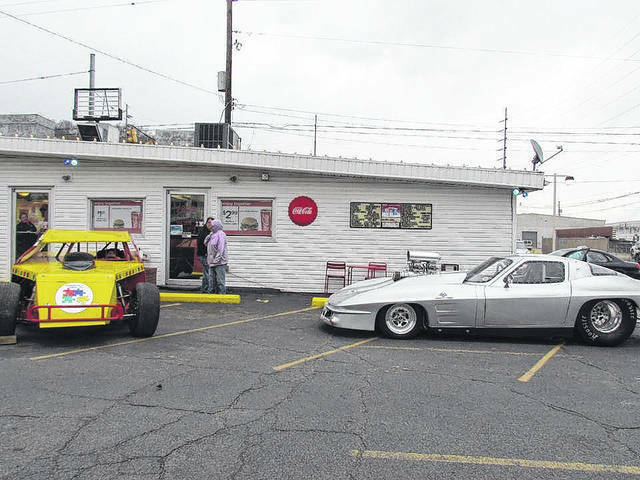 The Ohio Street Roaders are expected for a Cruise-In, and then there’s Jim Dandy’s food. Music will be provided by K.C., who used to work with WPAY. This year, Bell says the event has been expanded with several vendors. Disney princesses are coming out for the little ones to visit with. Inflatables will also be available. Bell says the event is all about bringing the community together. This is the sixth year for the event, and third at Jim Dandy’s. Bell says that just because he’s the president doesn’t mean he does it all. “I have a team — we have board members, our regular members and even people outside of the project that raise their hand and say ‘Hey, I want to help. What capacity do you need me?’ which is awesome.” he says. The event is a for celebration for autism awareness. Bell wants everyone to know it’s a celebration — there is no cost. Organizers just want people to celebrate with them. Bell also encourages everyone to wear blue throughout the month, whether it’s one of the blue T-shirts, or purchasing a blue light bulb at the hardware store for outside lights. He says the light bulbs show your neighbors that you support autism. Organizers will have the “I Wear Blue” T-shirts for sale for $13 Monday at the Light it Up Blue event. Then, from 11 a.m. to 4 p.m. April 21, the organization hosts the Autism Walk, which Bell says is just a day for fun. The walk is at Millbrook Park in New Boston. There will be lots of vendors and games, Bell says. “We have the District 11 Challenger League that will be playing, maybe three games. There is also a big auction.” He says that the publisher of The Daily Times is looking forward to it. Last year, auctioned off were a large screen TV, fishing poles, trips to Cincinnati and so much stuff, he says he could fill up a truck with it. On April 16-18 at Sonora’s in Portsmouth, the Autism Project of Southern Ohio will receive a percentage of the proceeds those three days, so Sonora’s will be Lighting It Up Blue, too. Bell says another thing the autism project does is sell puzzle pieces to local businesses, and when you patronize these businesses and you donate a dollar for the Autism Project of Southern Ohio, you receive a puzzle piece the businesses hangs in their windows. He says if you see puzzle pieces in a business, 100 percent of the proceeds from the donations go directly to the autism project. Not only do the events help those with autism, but provides fun and projects throughout the community.